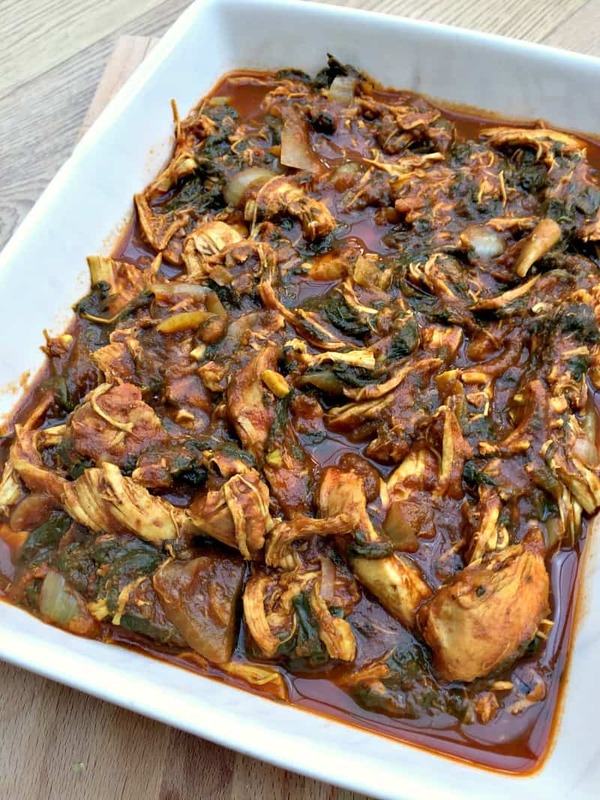 My slow cooker chicken saag curry is an easy to make, fairly mild curry with spinach that goes down well with my whole family and is an easy way to pack in the vegetables! Full of goodness, it fills the house with delicious aromas as it cooks. 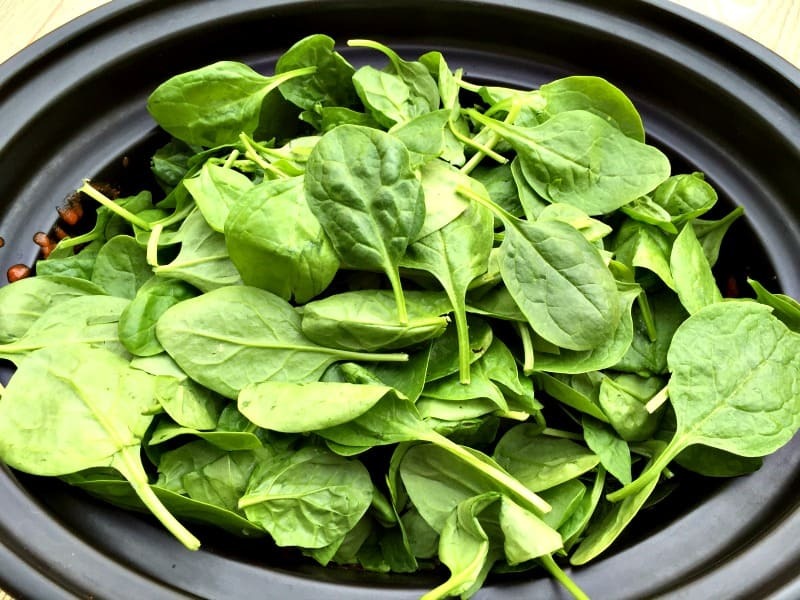 We love spinach and I was looking for a curry without coconut milk so it would be quite light and low in calories. 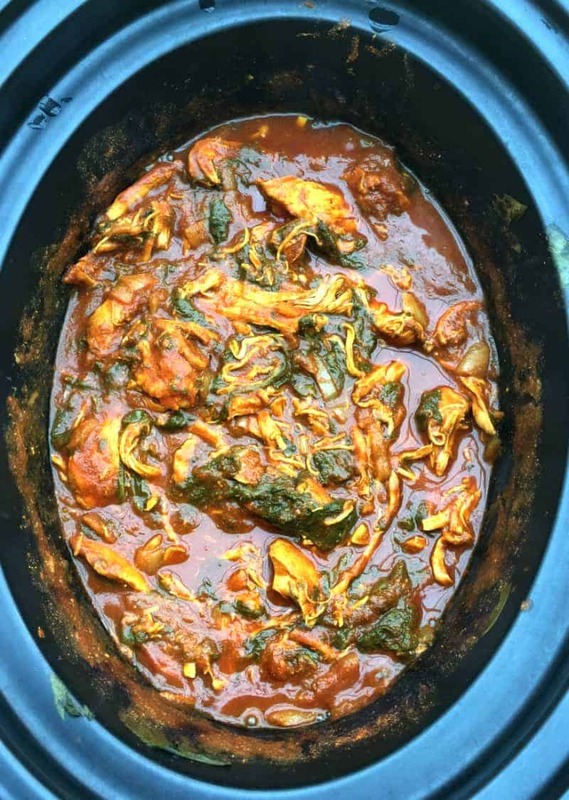 Slow cooker chicken saag curry seemed to tick all the boxes. Spinach (saag) is a great ingredient to include in a curry. This is a delicious, fairly mild curry (as I made it) which is suitable for all the family. Making it in the slow cooker lets the flavours develop and mix together during the long cooking time, which is ideal for a curry. I adapted this recipe from one I found on the Mamta’s Kitchen site here. I also regularly make this recipe with diced chicken thigh instead of chicken breasts, and usually make it without browning the onions off first, and it works just as well if you throw the ingredients straight into the pot. This makes it perfect for when you are short on time! This recipe is great too if you are eating healthily as it is not full of cream, oil or any of those nasties. Simple to make and low in fat and great for Weight Watchers and eating clean! I just love the colour when it is served, a plate full of colour is always the best. 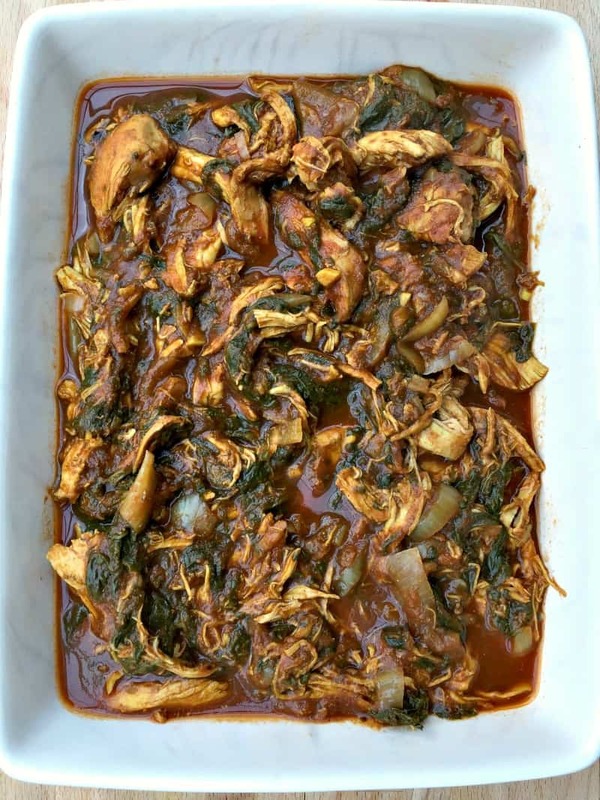 The spinach disintegrates and the tomato-based sauce has a lovely rich colour. 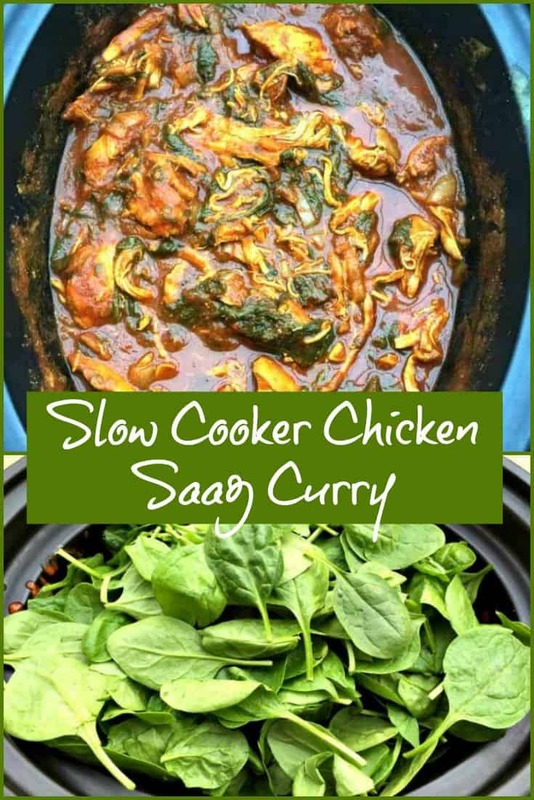 If you try my recipe for slow cooker chicken saag curry let me know what you thought by leaving a comment. Brown onion, garlic and ginger in the oil. When browned, add the spices except the garam masala and stir fry for a couple of minutes. Bring to the boil then reduce to a simmer. Add the garam masala. Add the spinach and let it wilt. Stir to mix it in once wilted. Add the chopped chicken and combine with the sauce. Half an hour before the end, taste and add more garam masala if needed. If you like, pull the chicken apart and stir into the sauce. This helps make the chicken go a bit further I find. Serve with rice, poppadoms or naan bread and raita. Add the onion, garlic, ginger and all the spices into the slow cooker pot. Add the passata and mix to combine. Add the chicken and mix it into the sauce. Place the spinach on top. Then follow from point 8 above. Do you chop up the garlic at all? This curry has turned out so well. It not just tastes amazing but also has a beautiful color which we can alter by changing the spices. Made this for dinner yesterday and it was amazing. The only thing I changed was that I put the spinach in right at the end so it just had time to wilt before serving. Hi….. could I add a cream to this? Hi Sarah, yes you could stir in some cream just before serving. Don’t add it during cooking though or it will split. Yum! Done this tonight using chicken thighs and can honestly say it’s the best tasting curry not from a take away.